Before we start – this is a fairly light hearted review, afterall, not everyone wants to talk about fish food all day long! 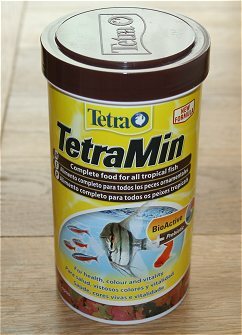 TetraMin is a popular brand of tropical fish food which you will often see in aquariums selling equipment and fish. Some sites even tout it as being the most popular brand in the world. We have no evidence to suggest that this is either true or false. It is normally available in 3 different pack sizes (although there may be more options), this is the larger one at £12.69 from a local dealer and it contains enough feed for around 2 months, for a 500L fishtank with around 25 fish in it ranging from Neon Tetras (being the smallest) to Red Finned Sharks – (note the red fin – not red tail as this is a different species). The flakes contain a balance of over 40 high quality ingredients for a rich and varied diet. Now its all very well giving details about what we think of the food – and it’s pretty much an established fact that its a popular make, but what about the fish? We ran out of tetramin fish food one evening (just kind of walked in the room to feed the fish and realised I should have been out and bought some earlier) and I ended up going to a popular super store to see if they had any there as the pet shop was closed. I bought some of what they had, but it wasn’t tetramin and the fish took ages eating what I gave them. Infact, this went on for days as I was determined to use up the cheap stuff I had bought in, but eventually I conceded to their tastes and bought some of their favorite. They hadn’t starved, but they had just picked at the other brand, and when I re-introduced Tetramin it actually took a few days for them to get back into eating – as though they were mad at me!!! 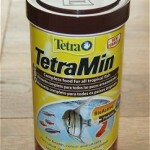 So for my fish it’s Tetramin Fish Food all the way!